Golf Week magazine enhances the enjoyment and understanding of golf by applying the highest standards of journalism to coverage of the game. 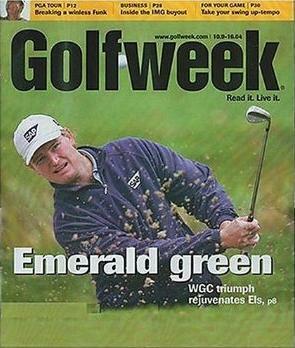 Golfweek Magazine is the only magazine avid golfers read with the most complete up-to-date authentic and authoritative information and results on all the professional tours, the collegiate and amateur games, profiles of players on the way up (and down), statistics, rankings, and complete coverage of the golf industry. Golf Week Magazine also has features on hot new golf courses and venerable old golf resorts, golf real estate, golf lifestyle, travel destinations, and the only source for health and fitness advice for the skilled golfer. Golf Week magazine coverage includes; PGA, LPGA, Senior PGA and PGA European Tours; mini tours, amateur and collegiate tournaments.